Growl is an intelligent system notification tool that lets you know when any event occurs on your system. It is basically a reminder application which provides you with alerts from a variety of sources such as browsers, email clients, media players, and other popular desktop programs. The desktop utility hosts a modern design and layout that requires less time to get your hands on it. The main function is to notify you when any event occurs on your PC. It lets you configure the appearance of notifications as per your preferences. You can use its Display tab to preview how the different styles of notifications look. There are few default options available within the program, but more styles can be downloaded from the Internet. The most impressive feature of this desktop widget is Remote Monitoring. When you are using a system on the same network as you have configured with Growl monitoring, you can choose to have the notifications available on other system also. This way you can monitor your system notifications remotely rather than locally. 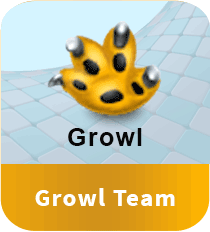 Moreover, there is also scope for forwarding Growl notifications to your mobile devices. This comes handy when you want to be notified when a lengthy task has completed. You can also set it to forward notifications to your email account. Download Growl to get notified when files finished downloading, friends came online, important email has arrived, and much more. Apart from letting you know when things happen, the full version of Growl for Windows gives you a full control over how you get notified and what actions to take in response to a notification. With Growl for Windows, you can configure how you want to receive notifications. You can choose to be notified with a visual indicator or an audible alert, or both. It’s also possible to choose the type of display for notifications, whether popups remain on the screen or not, and if notifications should be forwarded to another computer in a network. Overall, it’s a useful application to have on your PC if you’re a multitasker who needs reminders.